It’s the annual All Star break where the American League faces off against the National League for the home field advantage in the World Series of baseball. So I thought I’d put a spotlight on the men in black that everyone loves to berate and holler at. People like William Bendix in this fun black and white comedy from the people at Columbia studios and director Lloyd Bacon. Bendix gets it both ways in this comedy from writer Frank Tashlin. Our film starts off with baseball crazy Bendix losing one job after another for skipping work to catch as many games as he can. Be it live when his own boss spots him going off on an umpire or wondering off a job into the nearest bar to catch a game on tv. A few beers later and he’s not exactly capable of handling his job duties with the local phone company. Bendix has used up all his good will with wife Una Merkel. She’s calling an end to the marriage if he doesn’t get a steady job and give up his addiction to baseball and his hatred of he umpires. 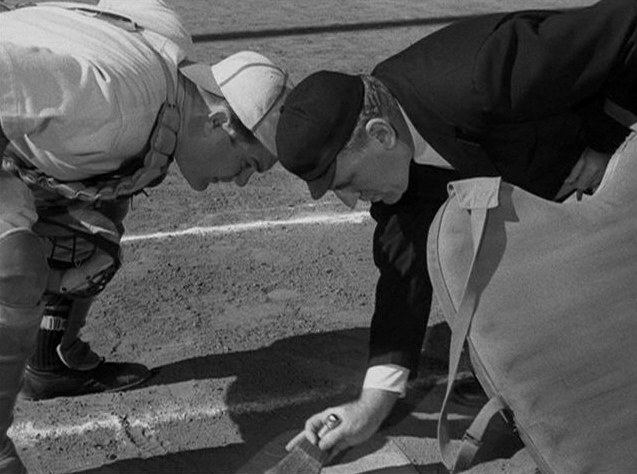 Enter Ray Collins as his father in law who suggests Bendix become an umpire so he can see all the games for free and get paid at the same time. “That’s the lowest a man can go.” says our perfectly proportioned lead actor. To save his marriage it’s off to umpire school where the hijinks kick into second gear. 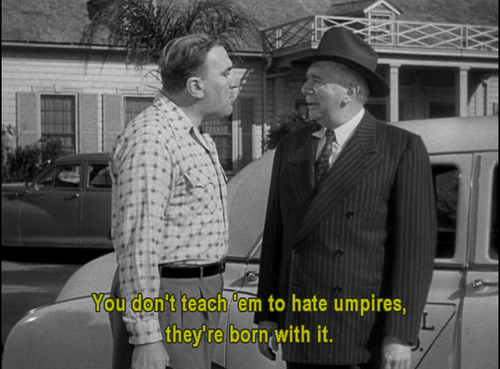 William Frawley is the head umpire trainer which instantly puts him at odds with Bendix. 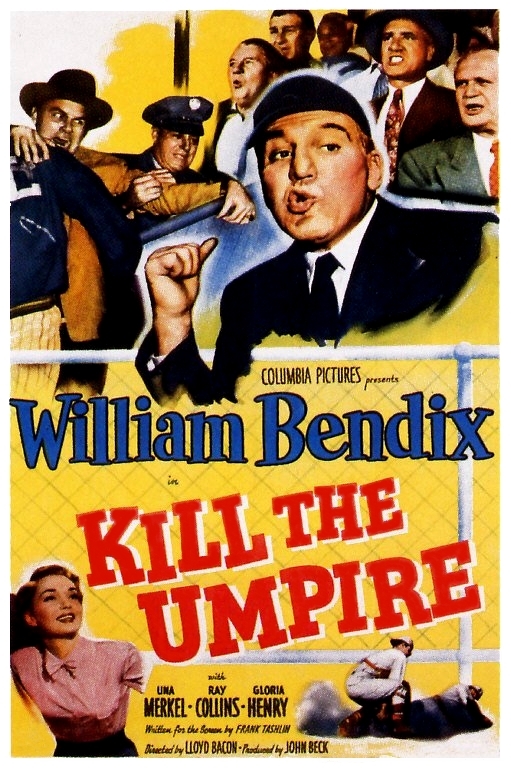 “How can I be an umpire, I’ve got two good eyes?” There are plenty of laughs to be had here including the scenes where Bendix acquires the nickname “Two Call Johnson”. From here Bendix begins to see how the other half live. He’s heckled, hit with tomatoes, bottles and boots whenever the rabid fans of the home team don’t like his calls. The film plays out in fine comedy fashion for a fast moving 80 minutes and before long Bendix just might wind up a hero. For a second or two. Till the next close call that is. At times the film has a very Three Stooges feel to it right from the start with the Columbia logo appearing and the song Three Blind Mice playing over the credits. Bendix gets in on the Curly Howard act with many of the pratfalls that come his way and if you watch closely you can spot Vernon Dent who appeared in numerous Stooge shorts as one of their usual adversaries. There is even an in joke on Bendix being accused of living The Life of Riley. A character he was playing on radio at the time before moving it over to series television. While not as well known as the Paul Douglas film Angels in the Outfield or as fondly recalled as Ray Milland’s It Happens Every Spring, this is a fun way to spend the afternoon when the real ballgame gets rained out.